The original Adbangle, 7 Day rush, Price Beat Guarantee. We won't be beaten on promotional wristbands. With production capability of 30,000 silicone wristbands made and sent same day, we are able to meet your needs for any event. We dare you to put us to the test! Whether you would like to reinforce the marketing material presented at a promotional event, provide your guests with a fun memento of a corporate night out or advertise a charity campaign supported by your company using printed wristbands in a range of colours, we can supply high-quality silicone wristbands in Australia that will help you to do so at a highly affordable price. We are able to customise your wristbands in a variety of ways to your exact requirements and specifications, from logo and printing details to added extras such as the addition of an analogue watch or a USB stick. Or our smart fitness band for sports enthusiasts; or if you have your own fitness store, these can be sold with your own branding and logo. The smart band easily syncs with your iOS or Android smartphone allowing you to track your sleep and fitness progress in real time. It also boasts a pedometer to monitor your walking or jogging speed and distance, and an in-call reminder and message alert for Android phones. It also comes in various colours and custom packaging. Don’t hesitate to contact us to discuss your custom requirements for this great and popular offer for tech-savvy sports enthusiasts. In addition to providing your company with great exposure, some of our bands can be used to keep track of guests at private events. 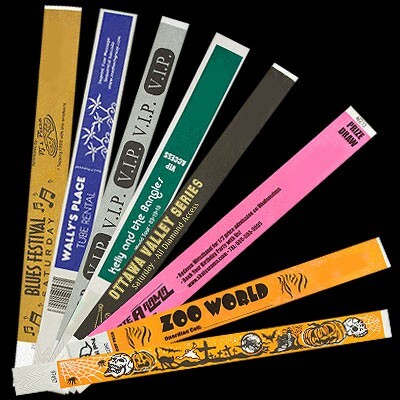 Custom promotional wristbands that are manufactured from Tyvek, which is a branded synthetic material made of flash spun high-density polyethylene fibres, must be cut off to be removed, making them an excellent choice for single use bands that enable security personnel to see at a glance who has actually been invited to an event and who is trying to gate-crash. These are available custom printed and tyvek bands are highly affordable with prices as low as 3c each. Because they have to be cut off, there is no danger of them being passed on to uninvited guests. If you would like to provide guests at an event with a memento that not only looks good but that will prove to be useful too, consider spending a little more and buying bands that feature USB flash drives or perhaps ones with a working analogue watch. Our promotional analogue slap watch wrist band is available in over 900 colours and can be printed, embossed or debossed with your logo and/or organisation name. Decoration methods include printing, embossing/debossing, embossed with ink filling, full-colour print, multicolour material, swirled effect material, glitter coating, colour changer effects and the very popular glow in the dark strap. Text can be customised with various fonts or we can use a funky font of your choice. These watches can be in common with the rest of our products in this category, these functional bands are available in a variety of eye-catching colours and can be printed with your corporate logo and name. For those concerned about the diminishing ozone layer and increasing skin cancer, we offer an amazing UV sensor wristband. Great for outdoor activities, the UV sensor wristband detects the sun’s UV levels in your area to warn you when it’s time to find a shady spot or head indoors. This is a trendy and excellent way to encourage kids’ awareness of the harmful effects of high UV levels when spending the day at the beach, at a picnic or any other outdoor events where kids could be exposed to high UV levels. Let us customise it with their name, favourite colour and size of your choice. 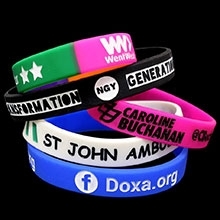 These wristbands are also used by the cancer association to promote cancer awareness. Dynamic gift also offers customised allergy alert wristbands. These hypo-allergenic rubber wristbands are available in a variety of guises. They can be embossed or printed with the allergy alert emblem and details of the allergy can be printed on the inside for discretion if required. Perfect for hospitals, clinics, doctors consulting rooms, health shops or any corporate companies with high staff count. Another popular wristband in America and Europe, known as a silly band, is now taking off in Australia. It’s available in multiple shapes, sizes and colours. 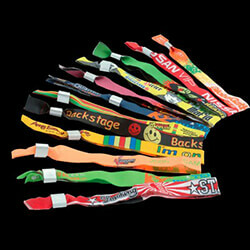 Kids are going crazy for silly wristbands and with your branding they make for a perfect promotional item. 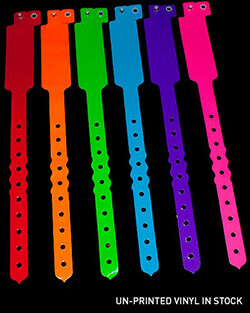 We also offer plain wristbands in various colours. These are ideal for water parks for keeping count of water slide and other rides. Simply offer the equivalent amount of silicon bracelets for the amount of rides paid for and remove a wristband with every ride taken. 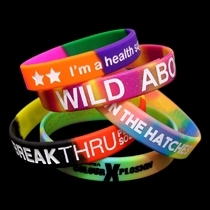 Whatever your requirements, Dynamic gift can produce wristbands for any function and activity. With so many possibilities and customising options, we can assist you in promoting any business or event with your own unique personalised wristbands. If you do not have the necessary in-house expertise to produce professional graphics for printing on your corporate giveaways there is no need to worry as we are pleased to be able to offer our valued customers a free design and artwork service. All you need to do is let us know what you require and we will take care of all the details. We will, of course, submit completed artwork for your approval before manufacturing begins, enabling you to make any adjustments to the design that you desire. We pride ourselves on the high level of customer service that we are able to provide and the fast turnaround that we offer all of our clients. Whether you wish to buy personalised wristbands for events or for a nationwide campaign, we can fill most orders within as little as 10 days and some within 5 days. We check the details of every order carefully to avoid costly mistakes and liaise with our customers throughout the design and manufacturing process. On written, like for like quotations, we guarantee to beat the best price you are offered, because we want to make absolutely sure that you are delighted with the service you receive.